One of a set of six stamps issued to mark “National Day” 1975 is a map stamp. “National Day” is November 18, the birthday of Sultan Qaboos ibn Said Al Said. The map of the Sultanate of Oman has been rotated to the west about 130° so that the point of the country which properly points north points to the southwest on the stamp. The error is that the detached point is twice as close to the rest of the country on the map as it is in reality. 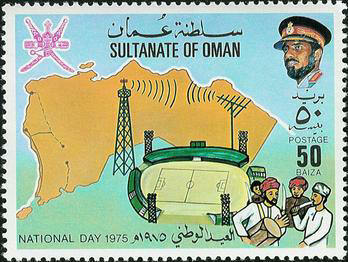 In addition to the map, the stamp also has the Omani coat of arms, crossed scimitars linked by a belt, and a khanjar or dagger, red with white fimbriations, in the upper left corner; a picture of the Sultan in the upper left corner, and a picture of the Sultan Qaboos Sports Complex in Muscat, and celebrants with a drum and flute.